Hello Fussy and Fancy Crafters here I am still playing Catchup with my challenge Blogs, This is for Challenge #193 which is hosted by the lovely talented Gina, she has chosen a lovely theme for this time 'Favourite Colour' This was an easy choice for me because July is my one and only Sister's Birthday and her absolute favourite colour is Lavender Blue. I had already bought the stamp I used for the topper, it is a Sue Wilson 'Stamps to Die for' I chose it because we both share a love of Art Deco art style. Sue is a beautiful crafter herself and makes the most wonderful Clean and Simple cards unlike my usual Pizza ...everything thrown at it style so I wanted to attempt to keep it as uncluttered as I could. 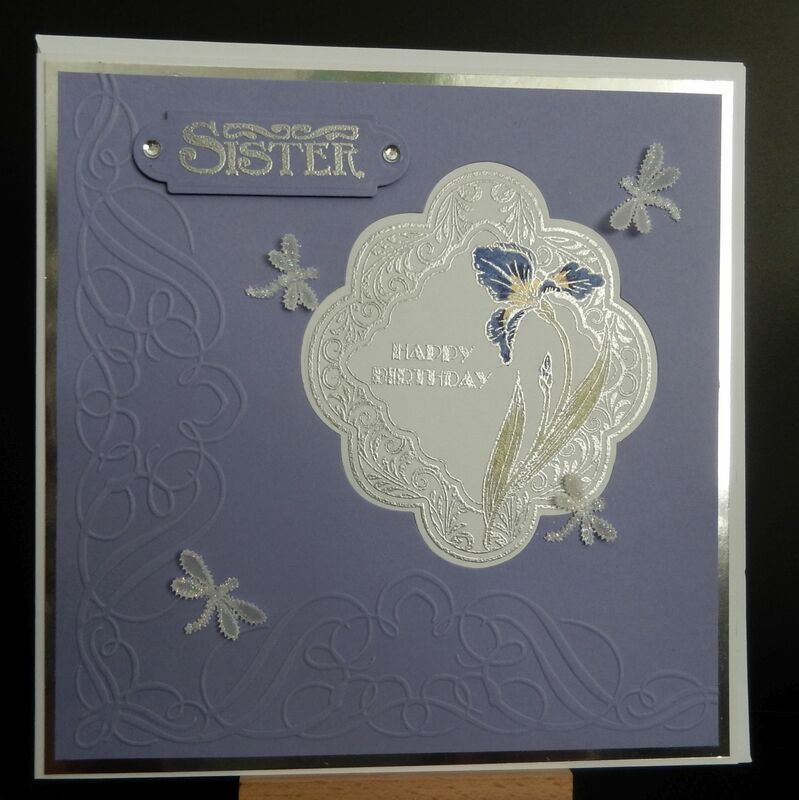 Using Iris coloured cardstock I ran it through an embossing folder which gave me a corner design, I cut out the aperture with the die that matched the stamp and then placed the topper in the aperture. 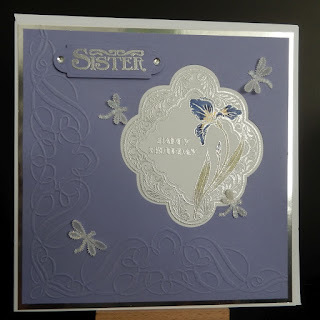 I stamped and embossed my Art Deco sister sentiment, then I spent a wonderful afternoon making parchment dragonflies ..... yes you guessed it, again Dragonflies always feature on cards between us, it is a long standing tradition from when my dear Mam was alive, there always have to be 4 representing the 4 women of our family. I love family traditions, don't you. So there it is a card full of favourite things for my Sister she has already received it and she told me she Loved it so that is all I need to know.